Most people hate the idea of attending a GUM clinic where they can be seen entering and leaving. This is why The STI Clinic was established: to bring confidentiality and privacy to laboratory-based STI testing. We have provided a fully integrated service that marries up the doctor and the laboratory, so if you test positive for anything, treatments are available. The problem with other home STI/STD testing services is that many are not backed up by healthcare professionals so there is no advisory or prescribing capacity. If you just want to rule out having the most common bacterial infections then we recommend the Chlamydia and Gonorrhoea combination test. This test will look for the two most common bacterial STIs in the UK. If you have been told by a sexual partner that they have an infection, you can get tested for that individual infection to check whether or not you have it. Where a partner has tested positive for something like chlamydia or gonorrhoea then treatment is recommended on a precautionary basis. How do I get one of the STI tests? All that you have to do is choose which test you want from the right hand menu. If the particular test that you are looking for is not listed, please go to STI Facts at the top of this page and click on the particular infection that you are interested in getting tested for. We can send the sample collection kit to you for next day delivery in the UK. Overseas orders can take longer. 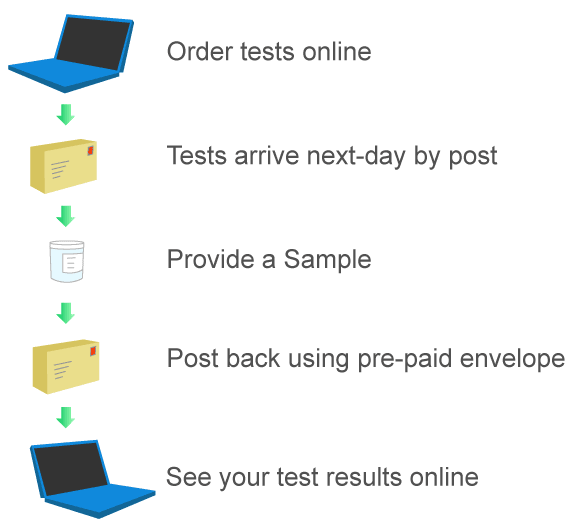 When we receive your sample back, results are available within 24 hours. The full screen will normally take longer because of the complexity but most results for the full screen are back within 2 days. Results are accessed online using your unique login. We believe that our results service is the fastest available lab-based STI service available in the UK.